This is I think the last dress Amy wears in the play ( I still have a few others to make for her). This one is still under construction. 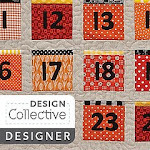 This is the bodice piece it will have a skirt that uses this embroidered fabric and it will also have a flounce on the skirt in coral orange same fabric I used on Meg's last dress that I showed. 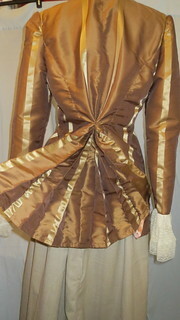 It will also have a sort of gathered ruched bustle but not a true bustle. This dress has caused me issues in making it the patten did not come out as the manufacturer designed it to ie to big in the waist. Thus you see the tape measure around the waist me figuring out what it would look like either belted or gathered to take in the extra fabric that I DO NOT LIKE AT ALL. 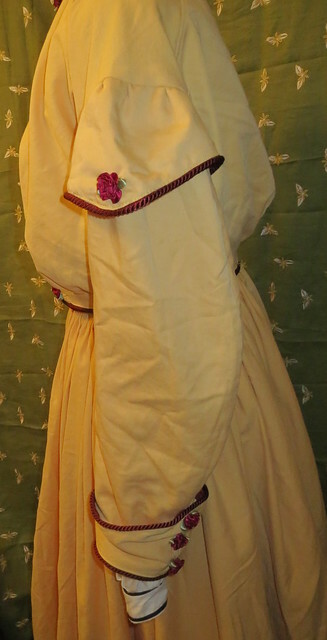 I have added 3 inches to the bodice area in height at the bosom to make it more modest and I may add a ruffle or a pleated area there still as it is still not to wear i want it for a modest dress. 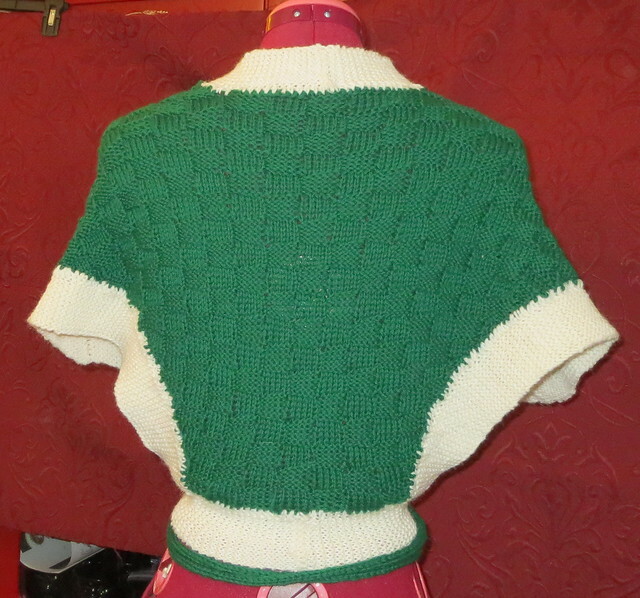 I am in the process of adding puff sleeves the pattern had no sleeves. 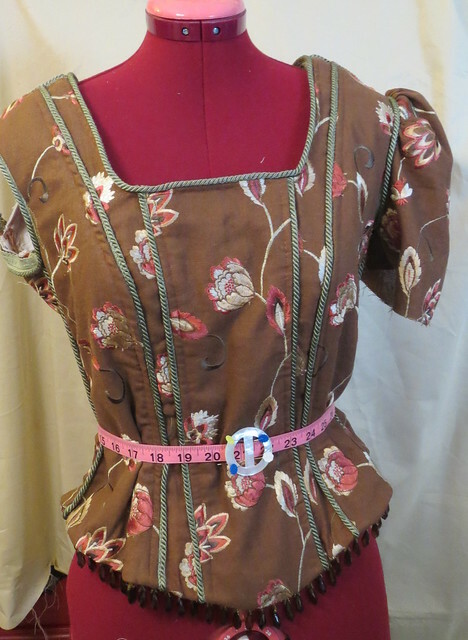 By the time I am done constructing this dress it will look nothing like the original pattern which sort of makes me happy as I did not like lots of it and am modifying all those parts to my liking. 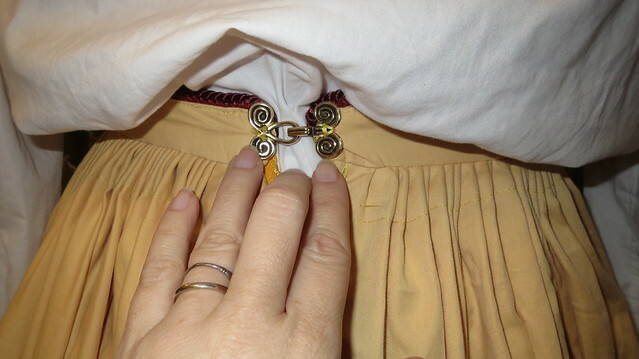 The bead trim you see I did not hand bead could of but did not. Found it thrift shopping for 50 cents a few weeks back and instantly thought of this dress. 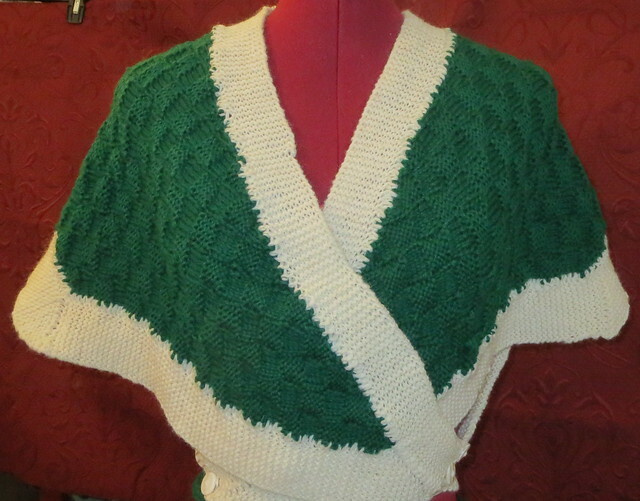 There will be a bright colored flounce right below the waist so I think it will stand out nicely. 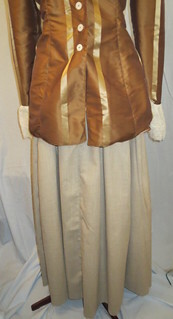 The 2nd peplum jacket I am showing is the very last outfit Jo wears in the play. It is spring time so soft feminine colors. This is also when Mr. Bear proposes to her. 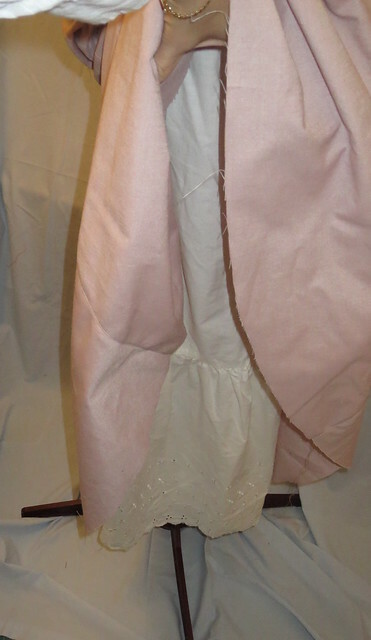 So I wanted it to have a hint of girlishness with eyelet and pink skirt. 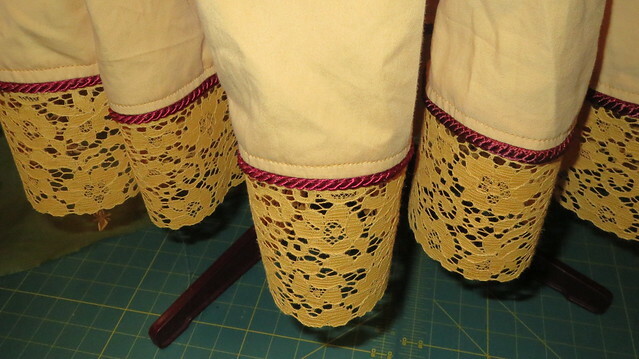 The petticoat that is attached also has eyelet lace on it . 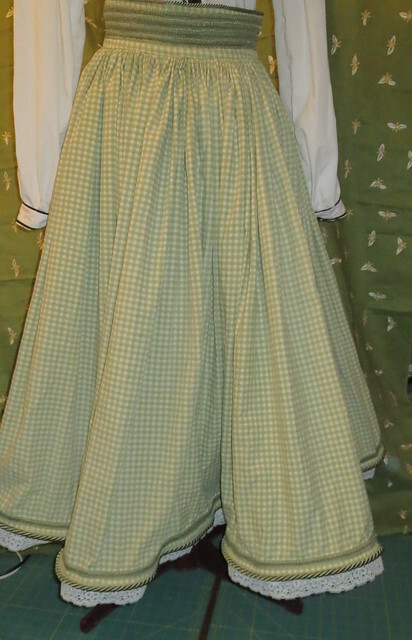 There is a wide cream gross-grain bow that goes around the seam at the middle area of the skirt but not shown in photo as I had not attached it yet. 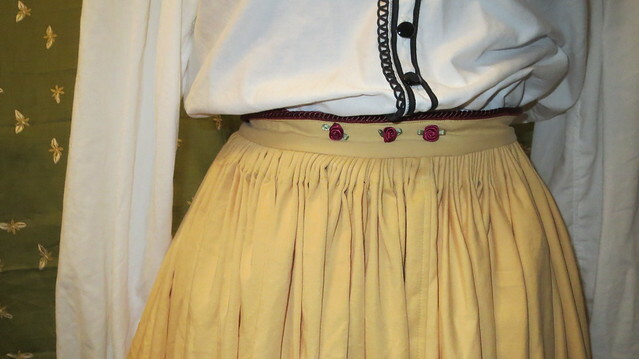 It is a simple detail but it finished the skirt nicely. This skirt is real full in the lower back. 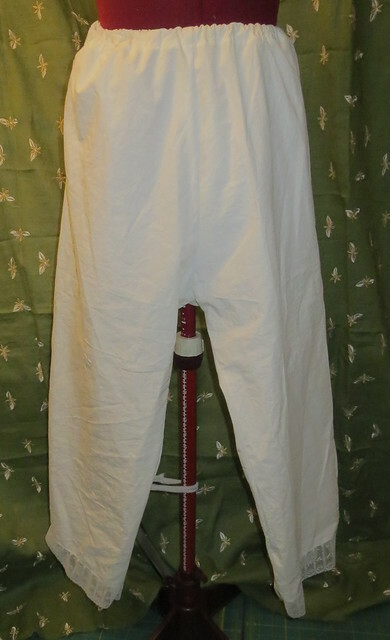 But it is fitted in the hips showing style changes that where happening in fashion. 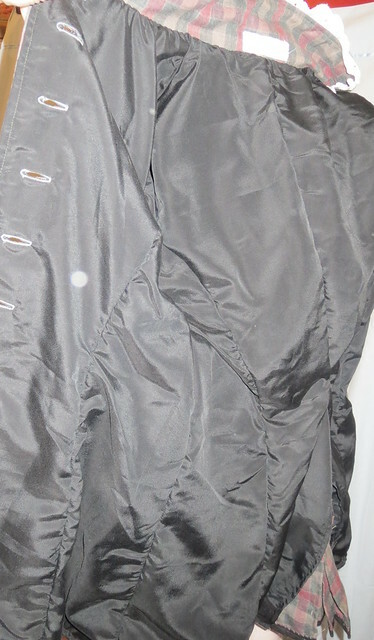 This jacket is also fully linen but in black sateen. 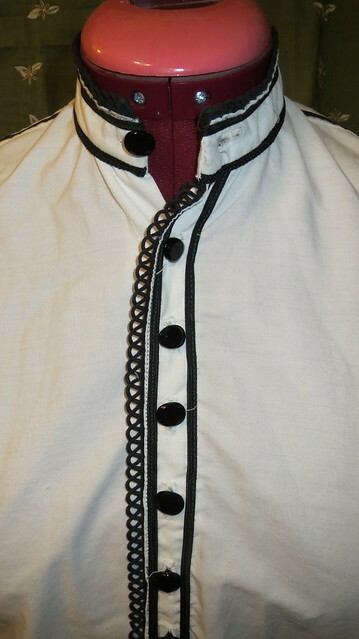 Once again I used antique mother of pearl buttons for the closures. 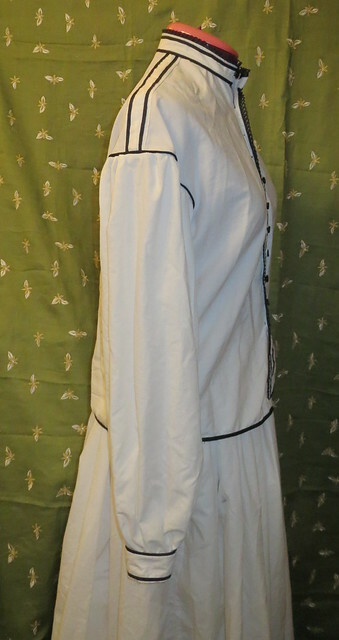 I have made two peplum jackets for the character Jo in the play with matching skirts these are for the final two scenes of the play. The second to last one is the brown one it is more of a fall winter scene and I wanted the dress to carry that color them with it. Since this is Jo I am still keeping her clothes leaning towards mens styling with hints of soft lace here and there. To show her character is softening some but still wants to do mens jobs. 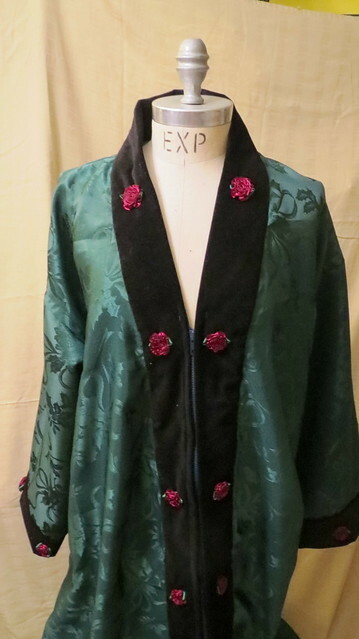 The fabric for the jacket was a remnant I found junking about a year ago that I really liked but it was too narrow for most patter pieces as it was only a foot and 1/2 wide but about 3 yards long. 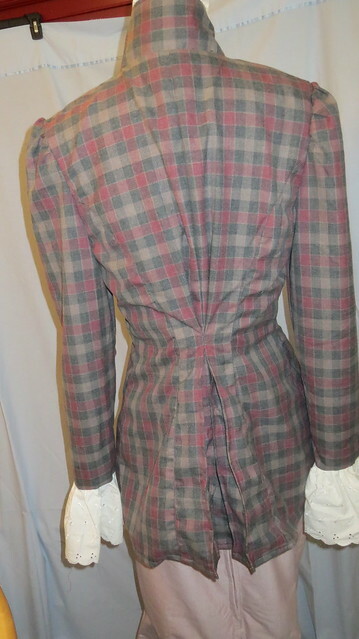 which was perfect for this jacket all the pieces fit in that space. 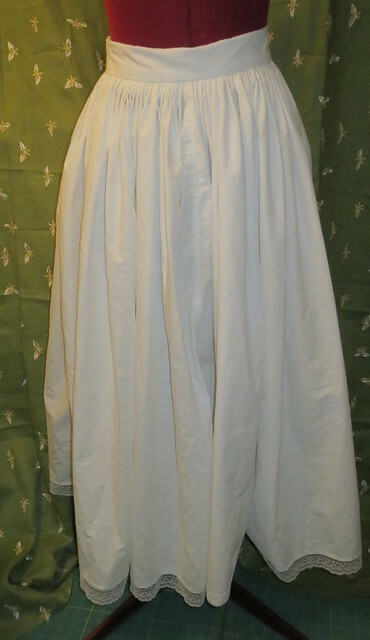 The full skirt is made from fine linen fabric I was given about 13 years ago that I was never quiet sure what I wanted to do with it. 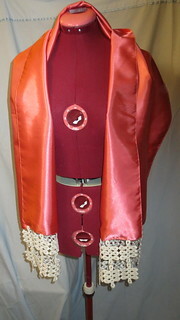 The skirt does have an attached petticoat and the jacket is fully lined with a orange sateen and the jacket has antique mother of pearl buttons. 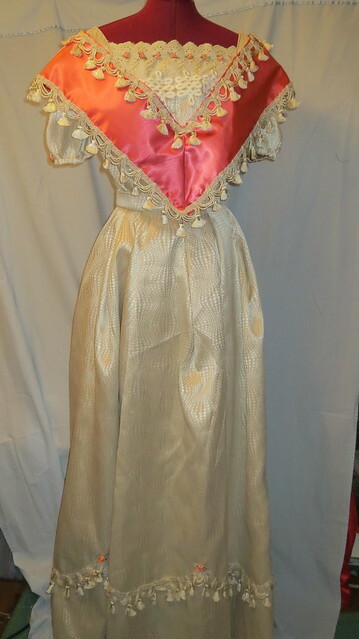 This is the dress Meg is wearing right before she gets married in the play. 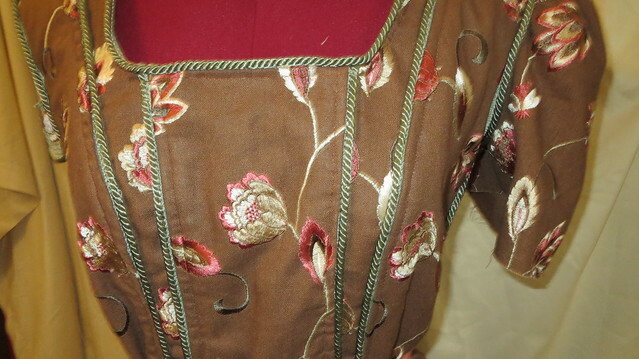 The fabric is actually an ugly brown color that looked dirty and such to me. So what did I do, yep you guessed it this is the backside of the fabric which is very pretty compared to the front color. This coral fabric is the same fabric I used on Aunt March's hat. 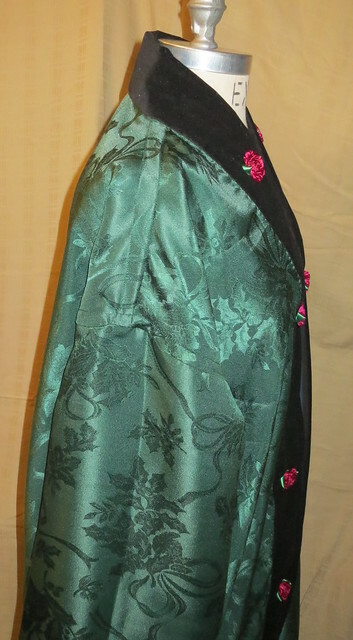 The roses on this dress are the last I have of this color so I used them all up there are 5 not on the dress in this photo but they will be before the play. 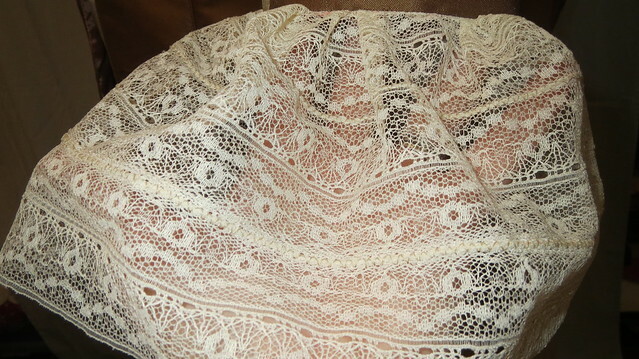 The eyelet lace you see is from a table cloth I found junking as is the cream fabric for that matter. Which I added to the dress as that part was not part of the pattern and it had such a low neck line it was immodest for the actress to wear. The fringe trim on this dress is more of that trim my friend gave me. The scarf you see is actually a shoulder wrap to go with this dress. Warning this post is heavy with pictures . 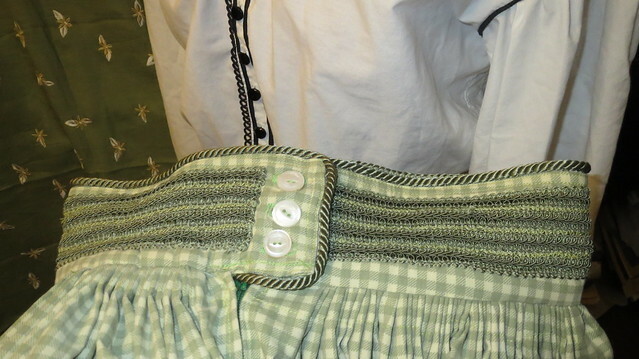 Up to this point you have seen four aprons for the character Hanna (servant) in the play Little Woman. 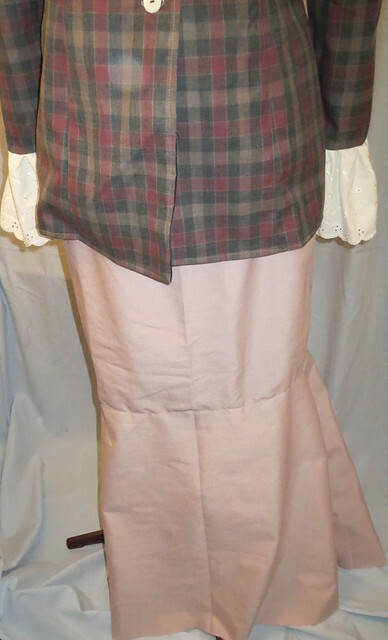 Well I have been sewing like crazy the last few days and Hanna now has 2 jackets, 1 geribaldi shirt, 2 skirts, 1 petticoat and 1 set of bloomers to add to her costume attire. It also means that this character is now fully costumed and done. I still have 11 other players to finish costumes on but having 1 done is a good feeling. 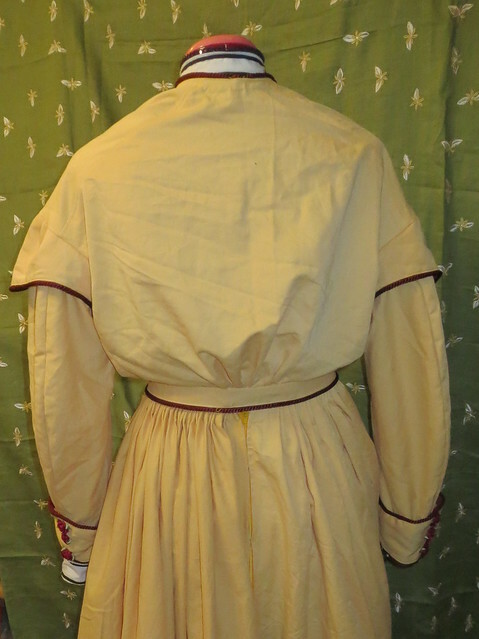 Because Hanna works for the March's sometimes with out pay she does not have much money so her cloths are simple with out much adornment and plain in patterning of fabric ( almost none) because she can only afford to but fabric that are like broadcloth or muslin. 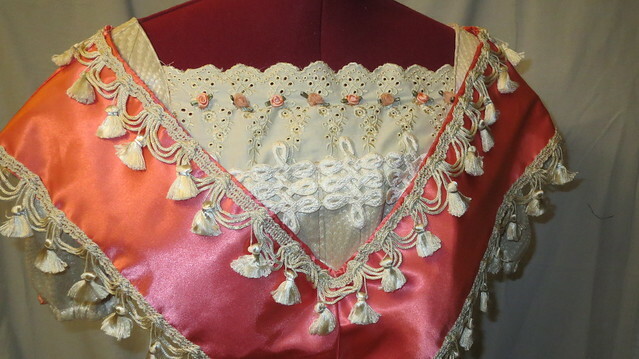 She does have little detail of lace here and there and cording and a few details as was the fashion then. 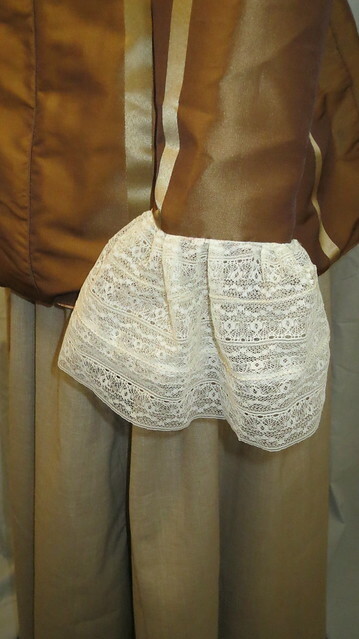 My dress form does not have an off set leg so the pantalets are just pinned to the front for the sake of taking a photo plain in general with a hint of pretty lace at the legs. 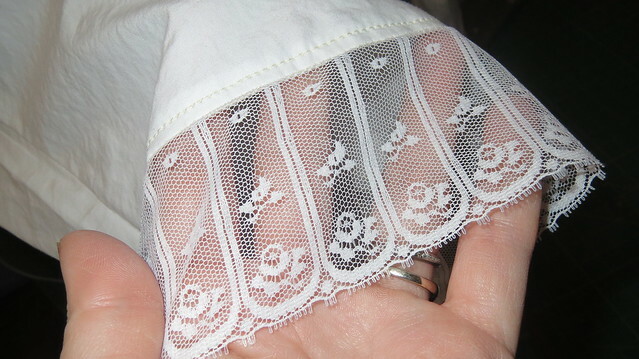 The petticoat is the same plain with a hint of lace at the hem. The shirt for this character is a Geribaldi shirt. 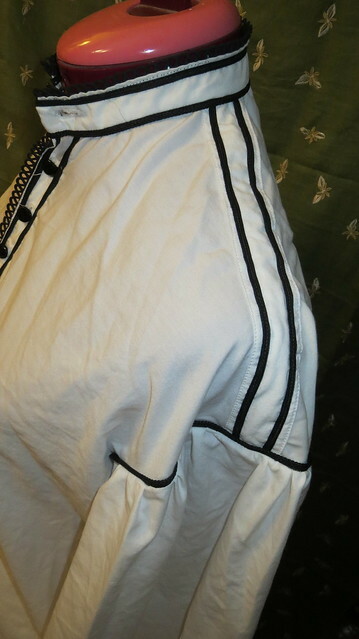 Made famous by a military person hwho came to much fame and this is the style of shirt his troops wore. The buttons on the shirt are true to period ie. The are antique jet buttons from the civil war to Victorian era. 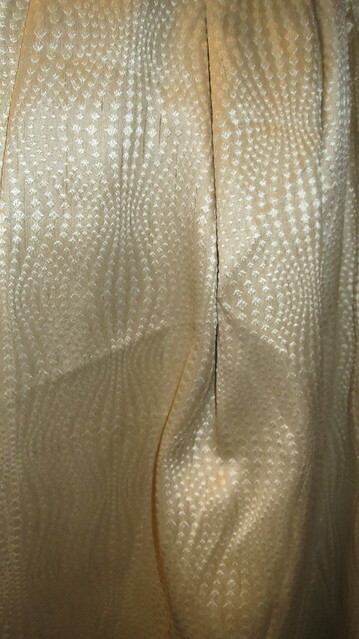 The lacy cord edge is from about 1920- 1950. 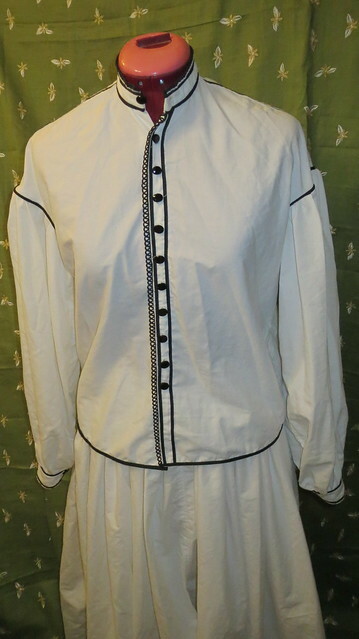 The other trims are also vintage just don't know exactly there age the piping on the sleeves is I think the 1960-1970's. 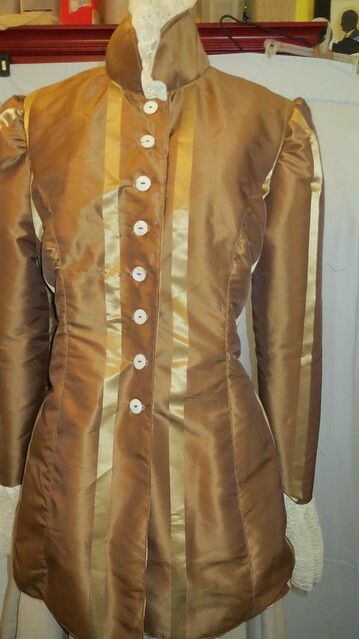 The soutoche braid I think is from about 1920 and the single fold seam binding used on the hem is from 1960's. I find most of my supplies at thrift shops and antique stores I like things to have an aged look and most times things are cheaper here than they are brand new fabric store. Which is fully because most are still in there original packaging and I am buying them at a modern store. I wish this was my size I love this shirt and would wear it. 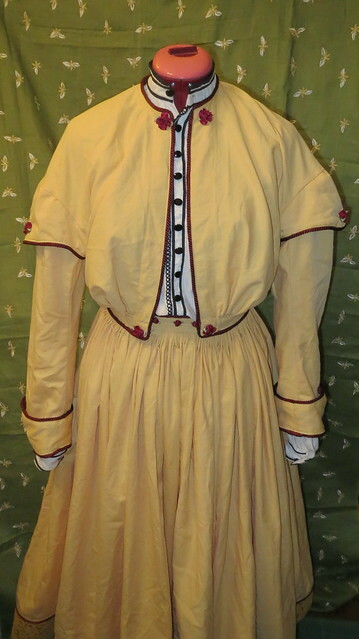 Hanna's yellow outfit is trimmed with burgundy cording and burgundy ribbon roses and a dark yellow lace around the hem. 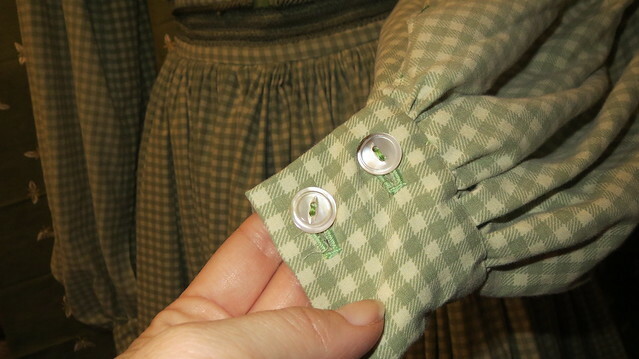 The other outfit Hanna wears is a green gingham dress. 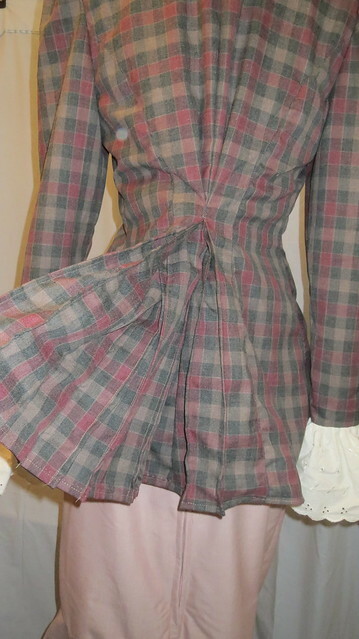 It too has a jacket and skirt. 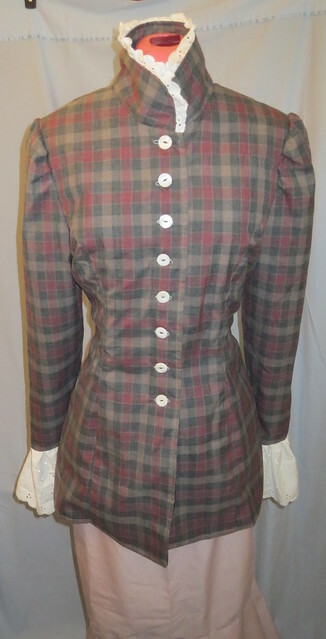 The buttons on this out fit are also very old antiques ( mother of pearl buttons). 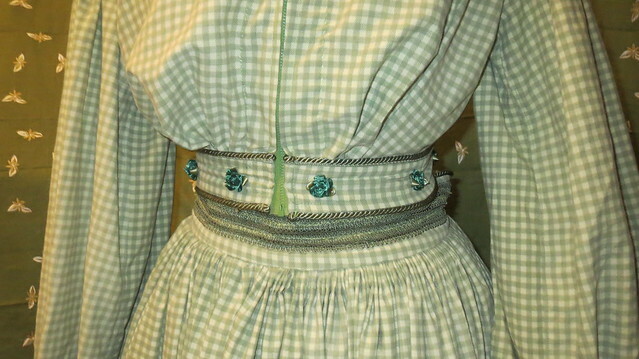 It is adorned with cording (upholstery cording), and upholstery trim around the waist of the skirt and bright green ribbon roses. 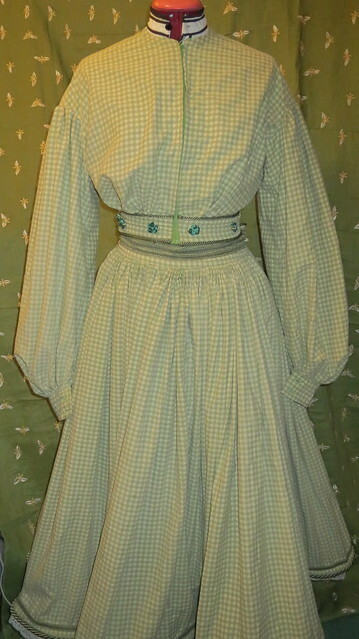 Every item Hanna's wears is made from vintage sheets. 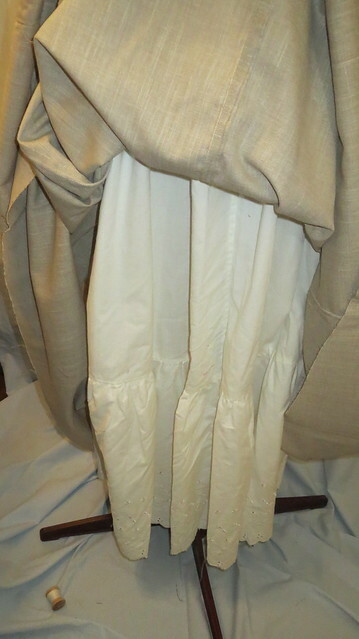 When I told the actor that she was surprised and said well they don't look like sheets any more. The actor is also smaller than any dress form I own. 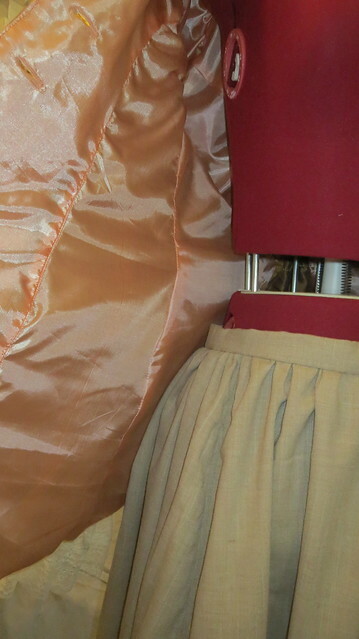 So if you notice things are not buttoned or zipped all the way in the pictures it is because I do not want to damage the costumes by trying to make them fit a mannequin they can't possibility fit well. Jo wears a writing cap up in the attic to keep herself warm in winter. I have made it in the style of a mans nightcap. With a few details for a girl like tassel and ribbon flowers. It was supposed to have a ribbon on it but I figured ribbon flowers was close enough for me. 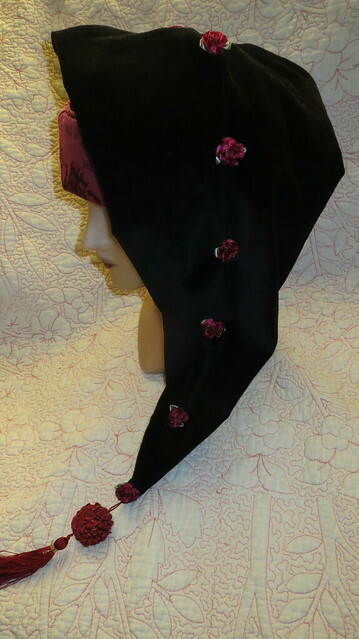 It is made from black velvet and a Christmas table cloth. 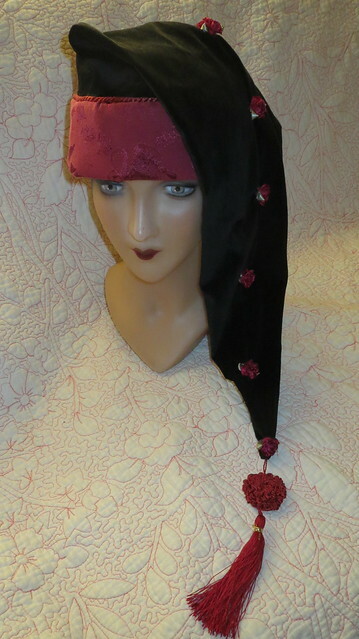 I used cording between the velvet and the brim of the hat. No pattern just made it up as I went. 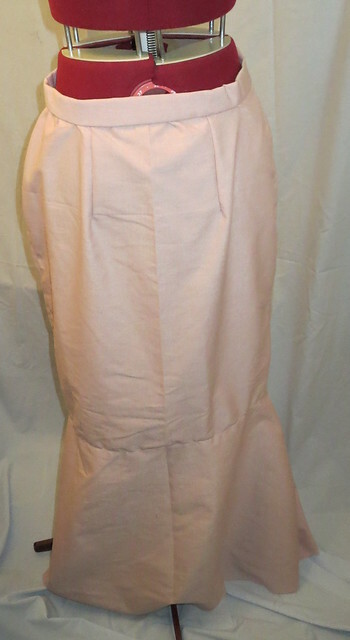 Jo is supposed to have a writing apron in the play. 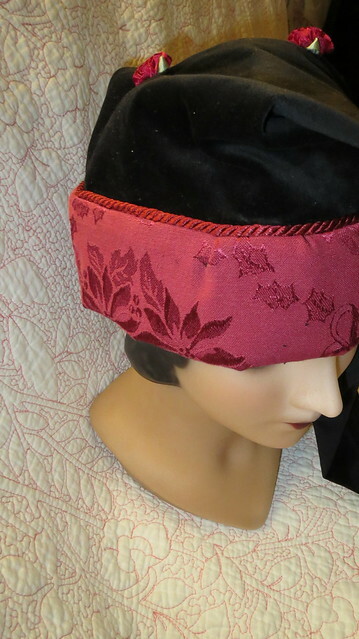 This is the item she wears to protect her clothes from ink spills when she is up in the attic writing it is supposed to keep her warm too when she is in the attic writing in the middle of winter. 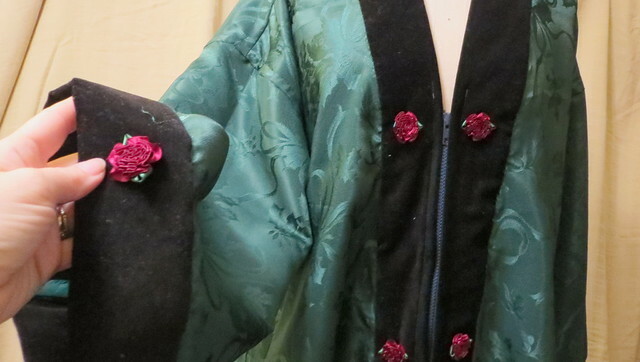 The description I was given was green satin apron big enough to cover all her clothes with hints of red ribbon. 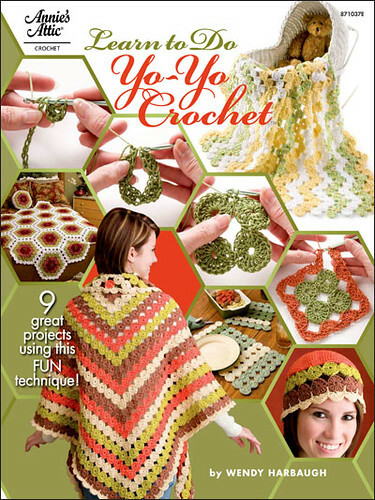 She is to have a hat too that goes with this apron have yet to make the hat. 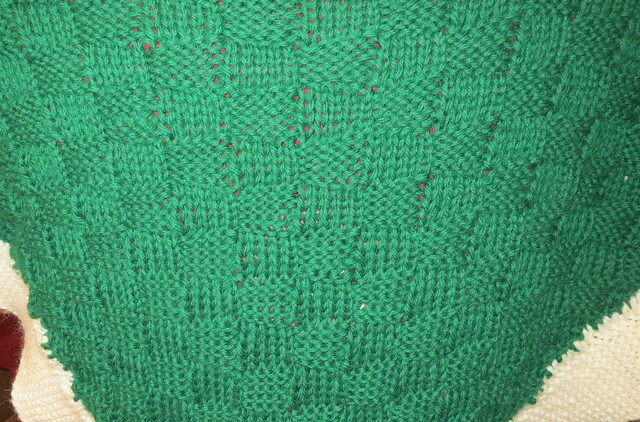 The apron is made out of a Christmas table cloth found thrift shopping thus the holly berry motif in the fabric. 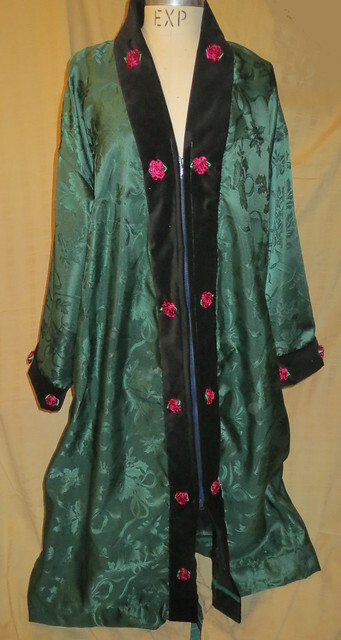 I used the same kimono pattern that I used for Mr. March's Dressing gown but no sash this time and I added a zipper to the front of it to make it easy for quick change. 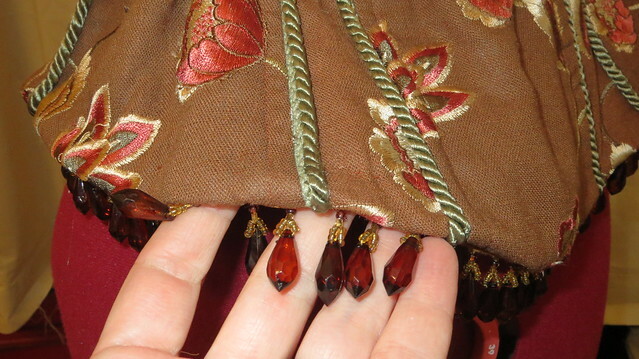 The zipper has two pulls so it can zip open down or up depending which is the best for the actress to do to accommodate her other outfits and the scene. Not sure if the hat is red or green yet I know it is supposed to have some sort of reddish bow. I plan on putting velvet on it too.